and unstressed syllables, and counting the syllables. to stressed; trochaic and dactylic meters are called falling. 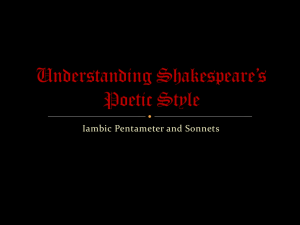 In the twentieth century, the bouncing meters-anapestic and dactylic--have been used more often for comic verse than for serious poetry. 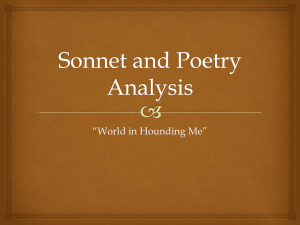 familiar because it occurs in all blank verse (such as Shakespeare’s plays), heroic couplets, and sonnets. Pentameter is one name for the number of feet in a line. single line. The second part of the name indicates how many of those feet there are in a line. is either stressed or unstressed. The following is a table of the most commonly used metrical feet in English. described as a poem written entirely in monosyllabic feet. Ere 'tis fit to touch our chaps--Marked with L. for our initial! 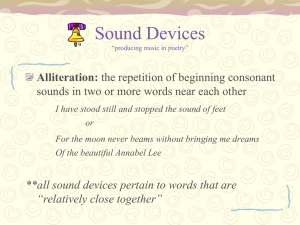 its common use in folk and popular song; it is also used in serious poetry. Oh, that rose has prior claims-Needs its leaden vase filled brimming? 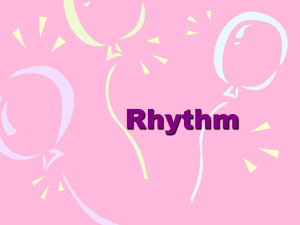 sprung rhythm (Hopkins) – inserting a number of unstressed syllables in between the stressed syllables. It gathers to a greatness like the ooze of oil Crushed. 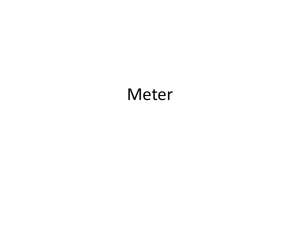 The second half of the meter name is just a number -- the number of feet in a line. and so on, although for obvious reasons anything longer than heptameter is fairly rare. those of Shakespeare; one modern non-sonnet examples is Wilfred Owen, "Dulce Et Decorum Est". iambic tetrameter -- Robert Herrick, "Upon Julia's Clothes"; Tennyson, "The Eagle". Dickinson uses this meter extensively ("Tell All The Truth But Tell It Slant", among others). trochaic dimeter -- Dorothy Parker, "Resume"
trochaic octameter -- Edgar Allen Poe, "The Raven"
anapestic dimeter -- Dr. Seuss, "The Cat in the Hat"
used to create an ironic effect, as in W.H. Auden, "The Unknown Citizen". Tennyson, "The Charge of the Light Brigade". 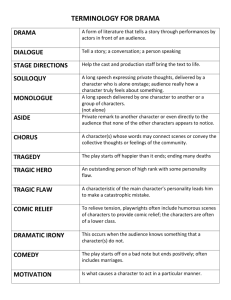 We describe a line of poetry with a two-word naming system, kind of like we use for cars and other objects. meter. 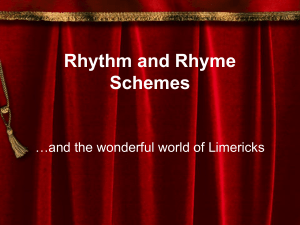 The scansion of a poem, its feet and meter, are what give the poem rhythm. (stressed, but not as heavily as the first syllable). 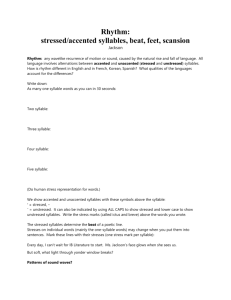 Syllables two and four are unstressed. 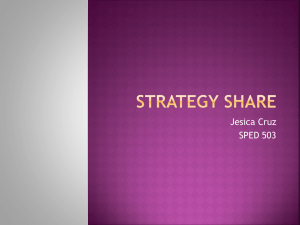 We can show which syllable is stressed in a word by writing a short diagonal mark over it ( / ). We can indicate an unstressed syllable by writing a small scoop mark over it ( U ). to know how many times that pattern repeats (how many feet there are). 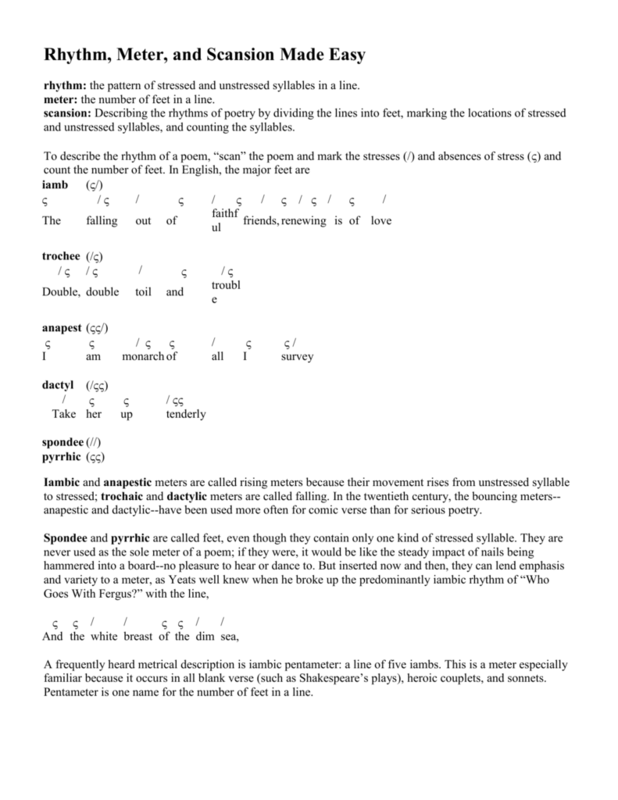 syllable line is octosyllabic, a ten syllable line is decasyllabic, etc. There are many different types of feet in poetry. One of the most common is the iamb. tells us there are five iambic feet, or five groups of unstressed-stressed syllables. The opposite of the iamb is the trochee. if not all, of the feet are, and how many feet there are in most, if not all, of the lines. 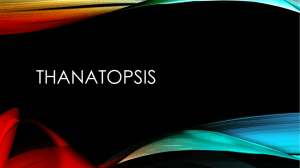 while the third and fourth lines usually consist of two anapestic or amphibrachic feet. She replied, When Ah itchez, Ah scratches.